The Garrison has always prided itself on the authenticity of its dress no matter which gunner regiment is being portrayed and as such, has standards that it sets and tries to help all members obtain. We understand that the buying of uniform and equipment is expensive and is a commitment in itself to the hobby. However we would like to think that after a member's first full season they would have kitted themselves out with the basic uniform and equipment. Boots, Ammunition; Anklets; Trousers, Battle Dress; Blouse, Battle Dress; Shirt, Collarless; Cap, General Service (with RA bomb cap badge on Red and Blue Diamond; Lanyard; and Braces. 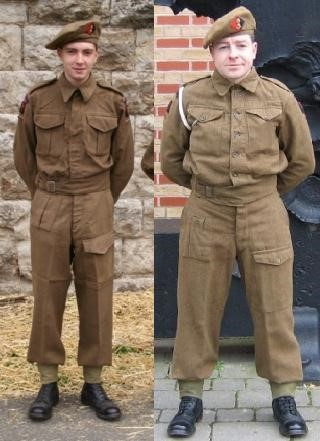 The Battle Dress can be either the early pattern, commonly called the 37 pattern, 1940 pattern or austerity 1940 pattern. With the standard of reproduction uniforms getting better all the time we don’t have any problem with members buying them, in fact it can be better for doing events in a repro as you then don’t have the worry of damaging them. With the addition of, an enamel mug, web belt, respirator, A.G. (gas mask) and helmet this is makes up the basic uniform and equipment, and if you brought nothing else this kit would get you through most artillery re-enactment weekends. We as a group do occasionally do pre 1944 events and for this we just change the General Service Cap for the Field Service Cap. Short Sleeve Order. This can be worn when ordered with either Braces Up or Down but with Leather Belt. Dog Tags, AB64 Solder's Pay Book, Greatcoat, Leather Jerkin, Service Khaki Pullover, Rain Cape, Set of webbing including Small Pack, Mess Tins, Knife, Fork and Spoon (KFS as the army called it), Army Clasp Knife. Large Pack, Holdall with your war time washing kit, Gas Cape, A set of Two Piece Denim Overalls, .303 Lee Enfield Rifle (either SMLE or No 4), Sports Kit: plimsolls, shorts, airtex shirt and not forgetting the socks. The list is endless and as you do more events you will soon pick up the next thing on your shopping list. For more information on the 1157 issued to solders please click here. Probably the best introduction to British WWII uniforms is the book by	Martin Brayley and Richard Ingram, 'The World War II Tommy: British Army Uniforms European Theatre 1939-45' (ISBN: 9781861269140). Available from all good booksellers, it is a very helpful reference for re-enactors. A wooden folding camp bed (although any camp bed will do), a wooden folding chair, some army grey or green blankets (5 is a good number as they can be used on displays), a sleeping bag, a personal first aid kit with any of your own medication, plenty of spare socks and underwear, a modern electric battery razor. Boots, ankle 2 pr Holdalls ? Braces 1 Shirts, Angola Drab ? Caps, Comforter 1 Shirts ? Draws, Cellular, Short 2 Socks, Worsted ? Early in 1937 the War Office decided to go thoroughly into the question of the most suitable dress and personal equipment of officers and men of the re-organized and now almost completely mechanized army. With the rapid increase of mechanization, it was becoming apparent that service dress was not the best possible wear for officers and men of mechanized units when on active service, and, in 1938, other ranks of mechanized R.A. units were ordered to wear "overalls combination" for training purposes, pending a decision as to a suitable dress for these units. Out of this grew battledress. 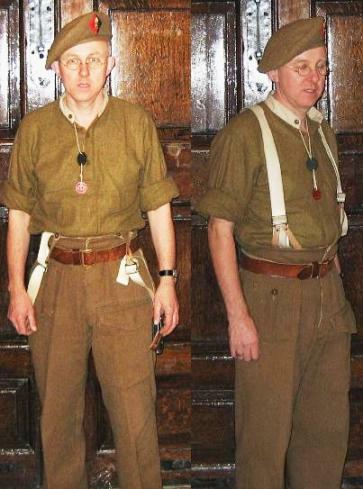 Trials of the Braithwaite dress and of an outfit based on a civilian skiing kit had taken place some years before, and it was suggested that a suitable dress might be evolved from these and from the black overall suits worn by the Royal Tank Corps. The Braithwaite dress consisted of a Norfolk jacket, peg-top trousers, deer­stalker hat and canvas gaiters. The skiing kit had a loose blouse with a collar that could be worn either open or closed, buttoned cuffs and a short skirt tucking into loose full trousers, which were buckled at the ankles. Trousers, similar to skiing trousers, loose fitting and buckled at the ankles. and in addition the drab field service cap, pullover jersey, woollen, or cotton drawers, ankle boots, socks and greatcoat. The material for the cap, blouse and trousers was denim. Extensive trials of this dress were carried out in 1938 as a result of which, in October of that year, it was decided that the Infantry battledress should be of serge, but that the Royal Artillery, in company with most other non-infantry units, would be clothed in denim. Luckily for the Royal Artillery it was realized, shortly after­wards, that denim was not warm enough for wear at home and on the 3rd March 1939 a serge battledress was authorized for all dismounted personnel of the Regiment. Horsed personnel were to continue to wear service dress. Blouse (1) Not cut so full. (3) Ventilation holes under arms. (4) Lighter and flatter buckle at waist. Trousers (1) Not cut so full. (2) Larger pocket on left leg. (3) Button fastening instead of buckle at ankle. (4) Pocket for field dressing at top of right leg. Anklets, Web (1) Strap and buckle fastening, with metal tag to strap. (2) Height reduced from 9 to 6 inches. Rank badges including those of officers, chevrons, skill-at-arms badges and shoulder titles were to be in worsted embroidery and worn as on service dress jackets. The blouse was to have no collar badges. The head-dress was to be that already authorized for active service except that those officers who wore the soft service dress cap would wear the drab field service cap instead. The shirt was to be of the existing pattern. 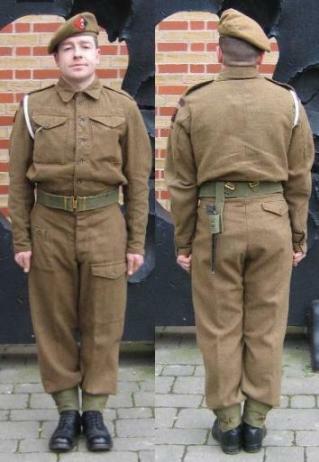 Officers were allowed to have their own battledress blouse and trousers made up from service dress materials up till 1941 when they were ordered to obtain these items from store. Blouse.— A new pattern blouse was issued in 1940. This had smaller buttonholes, stronger fly and a new type of buckle with teeth at the waist to prevent the belt of the blouse from slipping. The collar of the blouse was lined with drab drill in order to prevent the neck of the wearer from being chafed. In the same year gorget patches were introduced for officers for whom they were prescribed in service dress. These were similar to those worn in service dress but of miniature size. Previous to this commanders of formations had worn a scarlet cord boss on each end of the collar. Also in the same year officers were ordered to wear a coloured backing to their badges of rank in order to make them more easily distinguished from other ranks. This coloured backing varied according to the arm of the service; in the case of the Royal Artillery it was red. In order to identify the arms of the service all ranks were ordered to wear a strip of material on each sleeve of the blouse. In 1941, as a sequel to the above, an order was published discontinuing the wearing of shoulder titles. In 1942 it was decided to issue the "A.V." battledress to all ranks serving at home. This battledress was a protection against mustard gas vapour; it was not intended to give immunity from spray. On issue these garments were stiff and tacky and had a slight smell, these defects wore off in time. In 1943 the regimental designation "Royal Artillery" in red letters on a blue ground was introduced for wear at the top of both sleeves. This was in addition to the arm of the service strip. In 1945 an order had to be published prohibiting other ranks from making any alterations to the blouse which would prevent it from buttoning up to the top when the tie was not worn. A new pattern blouse was introduced in 1947. It had faced lapels and did not button up to the neck satisfactorily. In 1949 it was decided that the blouse would be worn open at all times including training and war, and that a regulation tie, without tie pin, would be worn. Trousers.—New pattern trousers were issued in 1940. These had a field dressing pocket, with button and button hole, the width of the leg was reduced at the knee and the bottom in order to give a better fit when anklets were worn, and they were lined with drill over the loins for greater warmth. Anklets.—In 1940 size 1 was discontinued and a larger size was added, the overlap of the straps was increased from 2 to 3 inches, and the brass tips of the straps were dispensed with. In 1942 it was decided that anklets need not be worn when working in offices or when walking out. Shirt.—In 1944 a shirt with collar attached was issued. Cap, Drab, Field Service.— 1939-1943. For regimental officers and other ranks. The badge for officers was the service dress collar grenade. 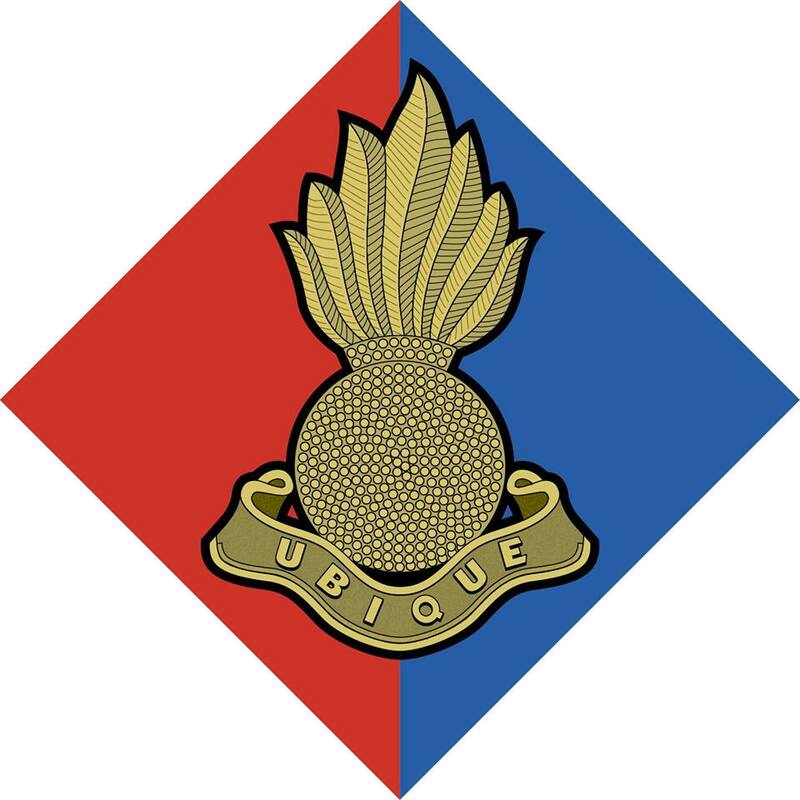 Other ranks wore the service dress cap badge until 1941, after which they wore a gilt grenade. Cap, Coloured, Field Service.— Worn by colonels and above from 1939-1947. Other officers could wear it when off duty. Cap, General Service.—1943-1947. A khaki cloth cap similar to the beret but even more ugly. It was originally made of gabardine. It was worn so that the band was level round the head and one inch above the eyebrows. The badge, which was the same as that worn on the service dress cap, was worn over the left eye centrally between the headband and the crown of the cap. Beret, Khaki.—1947-1949. In 1947 the khaki beret was introduced, to replace the cap G.S. gradually. It was to be worn in a similar manner to the cap G.S. . Officers were to wear the badge as for the coloured field service cap, and other ranks the service dress cap badge. In 1948 a gun badge, 2/3 the size of that worn on the service dress cap was introduced for wear on the beret by both officers and men. Beret, Blue.—1950 This is the normal wear for other ranks when in battle-dress, it is also worn by officers when on training or on other occasions when the service dress cap is unsuitable. The badge worn by the R.A. is the small gilt crown and gun. Since 1948 the R.H.A. have worn, in gilt, the Royal Cypher within the Garter surmounted by a crown and with a scroll beneath inscribed "Royal Horse Artillery". Beret, Green.—From 1943 to 1945 all commandos wore this beret. Beret, Maroon.—1943 This is the present wear for all airborne forces. Cap, Stiff, Service Dress.—This cap is now the normal wear for regimental officers with battledress, and has been since May 1949. It has also been the correct wear for Colonels and above, and for Instructors in Gunnery, Assistant Instructors in Gunnery and Master Gunners since 1943. It is now also worn by Warrant Officers Class 1. Black boots are normally worn with battledress. In 1941 officers were allowed to wear brown and other ranks black shoes, with or without toe caps, when wearing battledress at a dance. In 1942 this privilege was extended so that all ranks could wear either black or brown shoes or boots of civilian pattern in offices or walking out but not when on duty with troops. This still remains the rule, with a proviso that sandals, suede type shoes, shoes with thick crepe soles and other of the more curious types of footwear are forbidden. Neither the sword, nor the "Sam Browne" belt are worn in battledress. In 1948 it was decided that officers' web equipment would be held and accoun­ted for as for other ranks. This equipment is a belt waist W.E. patt. '37 with two braces and two attachments brace, bottle water with carrier, haversack with left and right shoulder strap, case pistol, pouch ammunition, pack, two straps web supporting, tin mess and lanyard pistol. In 1949 all ranks were ordered to wear belts waist web equipment when outside the precincts of their own barracks or quarters in the United Kingdom, whether on duty or walking out. Arm of the Service Strips.—These were introduced in 1940 for wear on battledress in order to identify the arm of the service to which the wearer belonged. They were worn on both arms below any formation badge. The strips were 2 inches long and ¼ inch wide. Those worn by the R.A. were red and blue, the red to the front. They were worn on greatcoats by those who wore battledress and were abolished in 1947. Arm Titles.— When service dress was introduced in 1902 the regimental designation “RHA, RFA, or RGA", embroidered in red on a blue curved strip, was worn by other ranks on the top of both sleeves of the jacket and greatcoat. In 1907 these titles were replaced by metal ones on the shoulder. Arm titles were revived in 1943 for wear on battledress by officers and other ranks and on service dress by other ranks and were then printed on cloth but are now embroidered. Emblems.—Emblems on the upper sleeve are worn on service dress, battledress and khaki drill jackets and on bush shirts in the following order from the shoulder down. First Field Dressing.—The first field dressing was first approved for issue on active service in 1884. Formation Badges.—Divisional signs were first worn in the Great War, they were discontinued by the Regular Army at the end of it, but were kept alive by the Territorials. In May 1940 an order was issued to the effect that divisional signs and badges would not be worn during the war, but, in September of that year corps and divisional signs were approved for wear at the top of both sleeves of the jacket and blouse. In 1943 they were to be worn at home on the jacket and blouse but not on the greatcoat, and they were to be printed. The best known R.A. formation badge is probably that of Anti-Aircraft Command, a black bow and arrow pointing heavenwards on a scarlet square. Identity Discs.—The first effort to identify casualties was made in the South African war when a linen slip with the man's details was carried in a pocket inside his jacket. This was replaced in 1906 by an compressed card disc suspended on a cord. Later on two identity discs, were adopted. (c). Other ranks wear a white plaited knife lanyard round the right shoulder. The knife goes into the right breast pocket. The knot used to go under the armpit but is now worn in line with the upper seam of the breast pocket. The R.H.A. wear a double lanyard. Prior to 1920 the lanyard was worn on the left shoulder and it was moved to the right at that time to allow the bandolier to go over the left shoulder. It was originally made of ordinary cord and was blancoed white for aesthetic purposes. Regimental Flashes.—Regimental flashes may be worn by R.A. Regiments. They are worn on the left sleeve of the service dress jacket or the battledress blouse only. They were first authorized in 1940 and are worn below the arm title or the formation sign when it is worn. The 5th Field Battery R.A. wears a flash of the French Croix de Guerre (1914-19 IS). This battery was awarded the Croix de Guerre in recognition of the stand that it made on the Aisne on 27th May 1918. The only other flash authorized for wear by a Regular Royal Artillery unit was the red diagonal bar on green of the 24th H.A.A. Regiment R.A. When 59th Medium Regiment R.A. became 24th Medium Regiment R.A. it took over the tradi­tions of 24th H.A.A. Regiment R.A. but discontinued the wearing of this flash. School of Gunnery and Experimental Establishment.—The personnel of the Experi­mental Establishment, Shoeburyness wear a double breasted reefer jacket, white trousers and forage cap. This dress was also worn by the School of Artillery when it was stationed at Shoeburyness. Service Chevrons, 1944.—In February 1944 service chevrons were authorized for wear on the service dress jacket and the battledress blouse. They were printed in red on khaki and had arms 3/16 inch wide and f inch long. They were worn inverted on the right forearm. One chevron was awarded for each year of service. R.H.A, R.F.A, R.G.A, R.A. (worn by ammunition columns and the Artillery Clerks' section only.) Riding Est. (appears only in Priced Vocab. 1907.) S. of G. (School of Gunnery.) The title "S. of A." re­placed "S. of G." about 1920, and although Clothing Regs 1926 and 1936 both give "R.A." as the title worn by the School, it apparently remained in use, in some cases, till 1939 or after. In 1924, when the Regiment was amalgamated, the R.G.A. and R.F.A. titles were changed to R.A. and now the only metal titles are R.H.A. and R.A. Embroidered titles and slip-on titles printed on cloth have been used in wartime in place of metal titles, but the latter were again authorized for general wear on service dress and for wear, by the R.H.A. only, on battledress, in 1951. Slip-on titles are worn on bush shirts. Steel Helmet.—First adopted in 1916. Wound Stripes, 1944.—In February 1944 wound stripes were authorized for wear on service dress jackets and battledress blouses. They were of narrow gold braid 1½ inches long worn as in 1916. One red rayon lustrous stripe could be worn to the rear of the first gold stripe if wounded in previous wars.